The body of the Aga Khan II was brought to Bombay by train and shipped for interment in Najaf. 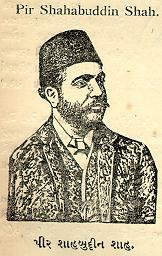 Mukhi Kassim Musa (d. 1314/1896), the then estate agent, was entrusted its responsibilities from Bombay to Najaf. He left behind a very important description of 25 days' journey, and his manuscript was copied by Itmadi Hussain Ali Kassim Ali Javeri of Surat. The narrator describes that the ship Mobalo of the Persian Navigation Co. carrying the coffin of the Aga Khan, sailed from Bombay on October 28, 1885 with 50 persons belonging to Aga Khan's family headed by Mukhi Kassim Musa and Nur Muhammad Ratansi. The ship anchored at Karachi, Gwadar, Port Abbas, Linga, Bushire and Basra. The caravan proceeded from Basra to Kazamain by a steamboat. The Turkish authority issued a special order that the bier must be accorded royal salute and honour at the port of Kazamain, and accordingly, about 500 soldiers paid tribute with musket shootings. Tajmah, the Aga Khan's sister had also come at the port with her people. The Iranian ambassador of Baghdad also attended with his staff. The processional crowd of over 15 thousand people trudged with the bier, and pursued the road leading to Karbala. A huge multitude of people flocked from the opposite side and joined the procession at a distance of five miles from Karbala. The narrator writes that the bier began to sail as if a vessel on the heads of the people. Prince Amyn, the nephew of the Aga Khan also joined with his sons in Karbala. The narrator describes that he had seen a school in Karbala, conducted with the funds of the Aga Khan for the education of the poor Sayed children, who got free scholarship and provision. The students and other people of Iraq also joined the procession. They alighted at Karbala for seven days, and the bier was placed in the shrine of Hazrat Abbas, then of Imam Hussain and finally it was carried to the courtyard of the tomb of Aga Khan's son, Aga Nur Shah, where the funeral service was offered. Thence, the caravan proceeded for Najaf, accompanied by a thousand people and 300 Turkish soldiers. Tajmah, the father-in-law of Pir Shihabuddin Shah, the people of Sayed Jawad Mutawali and Aga Mustapha Khan also joined the caravan. When they alighted at the vicinity of Najaf, a huge crowd dashed all of a sudden to receive the bier alongwith the guardians and Mujtahid of Najaf. The funeral rites were offered at the outskirts of Najaf. The narrator mentions that the whole business and transaction in Najaf were totally closed, where the multitude was more than that of Karbala. The bier was placed in the vault of Pir Shihabuddin Shah's shrine, and afterwards was buried with great honour. Writing about the shirne of the Aga Khan, the narrator adds that it had been built in advance. It was walled by the Chinese moulds with golden grating and a dome. The local cupolas and chandelier were hung in the middle, and the floor was fully matted with the Iranian carpets. It resembled the shrine of Imam Hussain and surmounted by an elegant workmanship. The narrator also describes the shrine of Hazrat Ali and its workmanship. He also describes a list of the graves of Aga Khan's relatives, such as Bibi Sarcar Mata Salamat, Shah Abul Hasan Shah, Imam Shah Khalilullah Ali, Aga Shuja, the brother of the Aga Khan, Pir Shihabuddin Shah and his mother and Sardar Aga Abul Hasan Shah etc. Mukhi Kassim Musa concludes his travel-account in these words: "We tarried for 25 days in Najaf and made secret charity of the bags of gold and silver coins in the name of Aga Ali Shah. About 30,000 townsfolk were repasted on the last day. 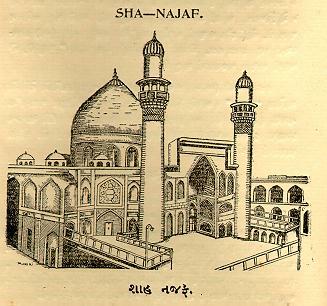 Rs.70,000 incurred from Bombay to Najaf, and we returned after a voyage of 25 days."